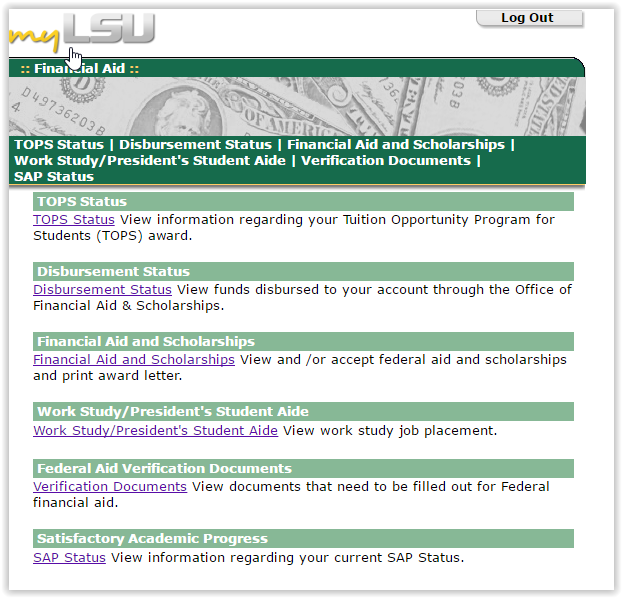 At this site you are able to get information on available financial aid through LSU. This includes consumer information, important deadlines, scholarship searches, and priority date information. On this website you are also able to view the cost of attendance at LSU. Also you are able to print scholarship forms, GRE/PRAXIS Waivers, and there is even a budget calculator. There is even a special tab especially for parents of students. Click to access the Office of Student Aid and Scholarships website. 2. 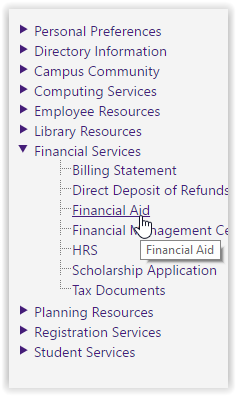 On the left hand side menu, click Financial Services and select Financial Aid. 3. A new window should appear, now you can select which of the offered links you wish to explore.